Using data published by the IPCC on the diminishing effect of increasing CO2 concentrations and the latest proportional information on global Man-made CO2 emissions, these notes examine the potential for further warming by CO2 emissions up to 1000ppmv and the probable consequences of decarbonisation policies being pursued by Western governments. The temperature increasing capacity of atmospheric CO2 is real enough, but its influence is known and widely accepted to diminish as its concentration increases. It has a logarithmic in its relationship to concentration. Global Warming advocates and Climate Change sceptics both agree on this. IPCC Published reports, (TAR3), acknowledge that the effective temperature increase caused by growing concentrations of CO2 in the atmosphere radically diminishes with increasing concentrations. This information has been presented in the IPCC reports. It is well disguised for any lay reader, (Chapter 6. Radiative Forcing of Climate Change: section 6.3.4 Total Well-Mixed Greenhouse Gas Forcing Estimate) . It is a crucial fact, but not acknowledged in the IPCC summary for Policy Makers. § Up to ~200 ppmv, the equivalent to about ~77% of the temperature increasing effectiveness of CO2. This is essential to sustain photosynthesis in plants and thus the viability of all life on earth. § A further ~100 ppmv was the level prior to any industrialisation, this atmospheric CO2 made the survival of the biosphere possible, giving a further 5.9% of the CO2 Greenhouse effect. § Following that a further 100ppmv, (certainly man-made in part), adding ~4.1% of the CO2 effectiveness brings the current level ~400 ppmv. § CO2 at 400pmmv is already committed and immutable. So CO2 has already reached about ~87+% of its potential warming effect in the atmosphere. Both sceptics and the IPCC publish alternate views of the reducing effect on temperature of the importance of CO2 concentration. These alternates are equivalent proportionally but vary in the degree of warming attributable to CO2. There are other views presented both by sceptical scientists and CDIAC, the Carbon Dioxide Information and Analysis Centre. What these different analysis show the is the amount of future warming that might be attributed to additional atmospheric CO2 in excess of the current level of ~400ppmv. Looking to the future in excess of 400ppmv, wide variation exists between the different warming estimates up to 1000ppmv, see below. A comparison between these estimates are set out below in the context of the ~33°C total Greenhouse Effect. 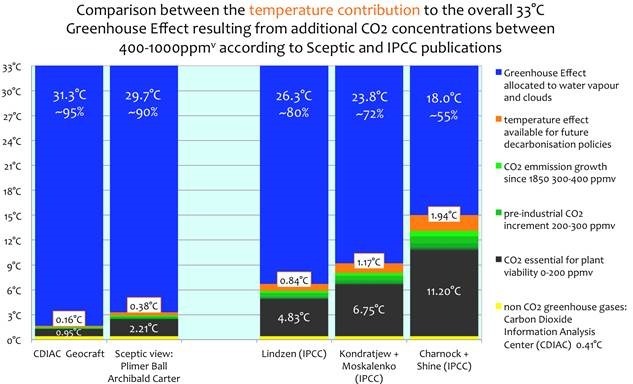 This graphic shows in orange the remaining temperature effect of CO2 up to 1000ppmv that could be affected by worldwide global decarbonisation policies according to each of these alternative analyses. Some of the IPCC data sets shows very large proportions of the temperature effect attributable solely to extra CO2. The concomitant effect of those higher levels of warming from atmospheric CO2 is that the proportion of the total ~33°C then attributable the water vapour and clouds in the atmosphere is displaced so as to be unrealistically low at 72% or 54%. It has to be questioned whether it is plausible that CO2, a minor trace gas in the atmosphere, currently at the level of ~400ppmv, 0.04% up to 0.10% achieves such radical control of Global temperature, when compared to the substantial and powerful Greenhouse Effect of water vapour and clouds in the atmosphere? There are the clearly divergent views of the amount of warming that can result from additional CO2 in future, but even in a worst case scenario whatever change that may happen can only ever have a marginal future effect on global temperature. Whatever political efforts are made to de-carbonize economies or to reduce man-made CO2 emissions, (and to be effective at temperature control those efforts would have to be universal and worldwide), those efforts can only now affect at most ~13% of the future warming potential of CO2 up to the currently unthinkably high level of 1000ppmv. So increasing CO2 in the atmosphere can not now inevitably lead directly to much more warming and certainly not to a catastrophic and dangerous temperature increase. Importantly as the future temperature effect of increasing CO2 emissions can only be so minor, there is no possibility of ever attaining the much vaunted political target of less than +2.0°C by the control of CO2 emissions. Global Warming advocates always assert that all increases in the concentration of CO2 are solely man-made. This is not necessarily so, as the biosphere and slightly warming oceans will also outgas CO2. In any event at ~3% of the total Man-made CO2 at its maximum is only a minor part of the CO2 transport within the atmosphere. The recent IPCC report now admits that currently increasing CO2 levels are probably only ~50% man-made. § probably beneficial up to about a further 2.0°C+ . It could be not be influenced by any remedial decarbonisation action, however drastic, taken by a minority of nations. In a rational, non-political world, that prospect should be greeted with unmitigated joy. · concern over CO2 as a man-made pollutant can be mostly discounted. · it is not essential to disrupt the economy of the Western world to no purpose. · the cost to the European economy alone is considered to be ~ £165 billion per annum till the end of the century, not including the diversion of employment and industries to elsewhere: this is deliberate economic self-harm that can be avoided: these vast resources could be spent for much more worthwhile endeavours. · were warming happening, unless excessive, it provides a more benign climate for the biosphere and mankind. 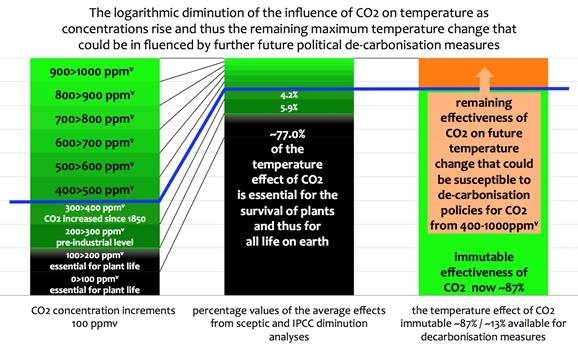 · any extra CO2 has already increased the fertility of all plant life on the planet. · if warming is occurring at all, a warmer climate within natural variation would provide a future of greater opportunity and prosperity for human development, especially so for the third world. To quantify what might be achieved by any political action for de-carbonization by Western economies, the comparative table below shows the remaining effectiveness of each 100ppmv tranche up to 1000ppmv, with the total global warming in each of the five diminution assessments. 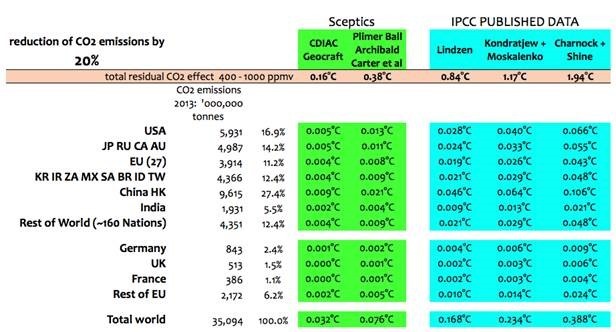 The table below shows the likely range of warming arising from these divergent (sceptical and IPCC) views, (without feedbacks, which are questionably either negative or positive: but probably not massively positive as assumed by CAGW alarmists), that would be averted with an increase of CO2 for the full increase from 400 ppmv to 1000 ppmv. The results above for countries and country groups show a range for whichever scenario of only a matter of a few thousandths to a few hundredths of a degree Centigrade. However it is extremely unlikely that the developing world is going to succumb to non-development of their economies on the grounds of reducing CO2 emissions. So it is very likely that the developing world’s CO2 emissions are going to escalate whatever is done by developed nations. These figures show that whatever the developed world does in terms of decreasing CO2 emissions the outcome is likely to be either immaterial or more likely even beneficial. The table below assumes that the amount of CO2 released by each of the world’s nations or nation is reduced universally by some 20%: this is a radical reduction level but just about conceivable. § the changing global temperature patterns, the current standstill and likely impending cooling. § the rapidly growing CO2 emissions from the bulk of the world’s most populous nations as they continue their development. § the diminishing impact of any extra CO2 emissions on any temperature increase. § normal daily temperature variations at any a single location range from 10°C to 20°C. § normal annual variations value can be as much as 40°C to 50°C. § that participating Europe as a whole only accounts for ~11% of world CO2 emissions. § that the UK itself is now only about ~1.5% of world CO2 emissions. As the margin of error for temperature measurements is about 1.0°C, the miniscule temperature effects shown above arise from the extreme economic efforts of those participating nations attempting to control their CO2 emissions. Thus the outcomes in terms of controlling temperature can only ever be marginal, immeasurable and thus irrelevant. The committed Nations by their actions alone, whatever the costs they incurred to themselves, might only ever effect virtually undetectable reductions of World temperature. So it is clear that all the minor but extremely expensive attempts by the few convinced Western nations at the limitation of their own CO2 emissions will be inconsequential and futile. As global temperatures have already been showing stagnation or cooling over the last seventeen years or more, the world should fear the real and detrimental effects of global cooling rather than being hysterical about limited, beneficial or now non-existent warming.